Place the rice, quinoa, water, and salt in a medium saucepan. Cover, bring to a boil, reduce the flame to medium-low and simmer for 20 minutes. While the rice is cooking prepare the shiitake filling. Place shiitake in a saucepan with 1 cup water and bring to a boil. Reduce flame to low, add shoyu and maple syrup, cover and simmer 20 minutes. Remove shiitake and place in a small bowl. The shiitake cooking water may be chilled and used as a dipping sauce for the sushi, if desired. When the rice is done, remove from the flame and let sit for 10 minutes. Remove and place in a mixing bowl. Heat the mirin and vinegar, but do no boil. Thoroughly mix the vinegar solution in with the cooked rice, fluff to cool, if the rice is hot. The best sushi is made with room temperature or leftover rice. Hot rice causes the nori to fall apart easily. Take a bamboo sushi mat, set it on the counter or cutting board. Place a sheet of sushi nori on the mat with the rough, dull side facing up. Take 1 1/4 to 1 1/2 cups of cooked rice and spread it evenly on the bottom half of the sheet of nori. Moisten a wooden spoon or rice paddle and press down firmly on the rice to evenly spread and cover half the sheet of nori. Place 3 or 4 slices of shiitake, in a straight line, across the center of the rice (horizontally). Place 3 or 4 slices of avocado on top of the shiitake, in a straight line. Add several pieces of ginger pickle. Pull the mat up with your thumbs, hold and tuck the fillings with all eight fingers. Roll forward in a jelly roll fashion, and tuck the nori forward, while pulling back the mat slightly each time you roll forward. 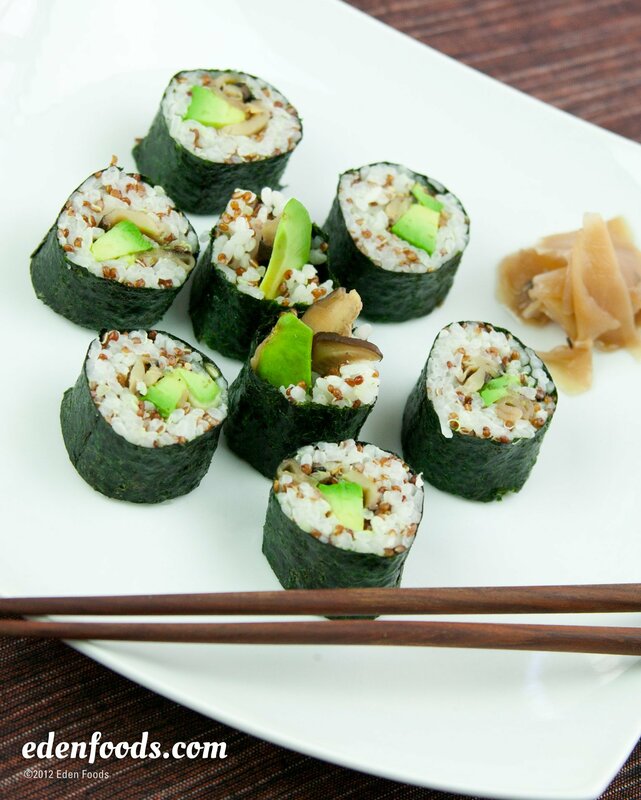 Just before you reach the end of the sheet of nori, moisten the end with a little cold water. Continue rolling until you have a cylinder shaped roll. Tightly wrap the bamboo mat around the roll, and squeeze gently to seal the nori roll. Leave the mat around the roll. To make the ends of the roll even, with your hands, take a little rice and place it in each end, tapping lightly with a wooden pestle or spoon handle to pack the rice firmly into the ends. Remove the mat and place the roll on the cutting board. Moisten a sharp knife with water and cut the roll in half. Cut each half in half, then each quarter in half, moistening the knife each time before cutting. You should now have eight equal size pieces of sushi. Repeat the above steps until you have 4 rolls or 32 pieces of sushi. Try mixing a little Eden Wasabi Powder (Japanese Mustard) in with the shiitake cooking water before chilling and using as a dip sauce. (See Eden recipe). NOTE: If using Eden untoasted nori, stove top toast per package directions before making sushi.